Edit January 2 - Click here to visit our Subway Sub of the Day 2018 post here. Subway Sub of the Day promo is back! 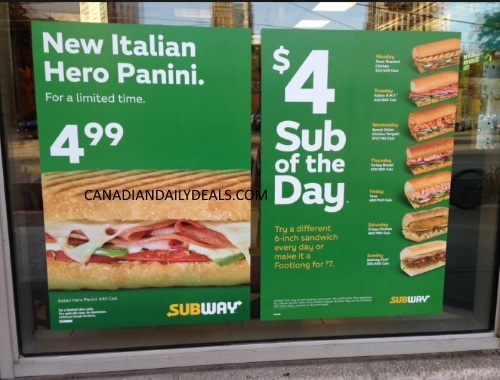 Every day there is a new sub of the day promotion! Get a footlong for $7 or a 6-inch for $4. Offer is available for a limited time only. Prices and participation may vary. I found this promotion at my local Toronto Subway (Harbourfront area) so as with everything, it might not apply everywhere. Ask before you order. I also got Subway coupons in my mail recently, so look out for that too (in certain markets).